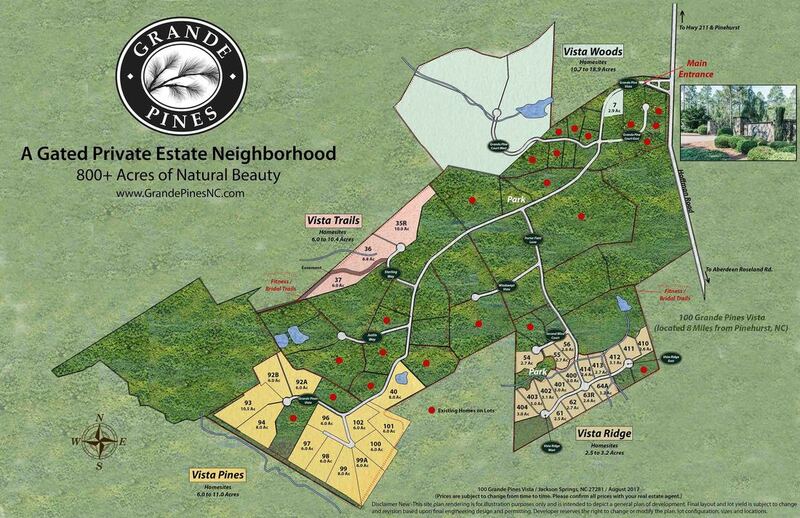 Grande Pines places you in the center of a recreational paradise. Located 7 miles from Pinehurst- the famed Golf Mecca- and centrally located within the beautiful state of North Carolina, the Mountain and Coastal Regions are a quick escape from everyday life. Elegant Southern traditions and a pine-covered, rolling landscape are the inspiration behind this 830 acre development. In lieu of clear cutting the timber and stacking homes on tiny lots, Developer Pete Mace chose to create a close knit, private community with the aesthetics of an old-time plantation. Distinct custom homes have been built by the area’s finest home builders and include Winner of the 2007 Moore Country Home Builder’s Home of the Year. A variety of styles include Tuscan, Tudor and Southern Colonial. Minimum required for Grande Pines homes is 2,800 heated square feet. Grande Pines is a build at your own pace development. There are no restrictions on the start of construction and our Architectural Guidelines ensure a quality built home and protect the value of your investment. The 15 foot wide easements throughout the property are perfect for bridle, biking, and hiking trails. Trails are well marked and allow you to explore the Pine plantation, woodlands and creeks that are rich in wildlife. The Property Owner’s Cabin is the perfect spot to unwind. The Sandhills region is a golf Lover’s paradise, being home to over 40 courses. Since the early 1900’s, some of the biggest names in golf have perfected their strokes here in the shadows of the Longleaf Pine. Famed Pinehurst #2, where both the Men’s and Women’s US Opens were played in 2014, is only minutes away. Within a short golf cart ride, Foxfire Country Club offers two Gene Hamm classically designed courses. Grande Pines residents are also Foxfire Village Residents and have access to Foxfire Village Amenities.